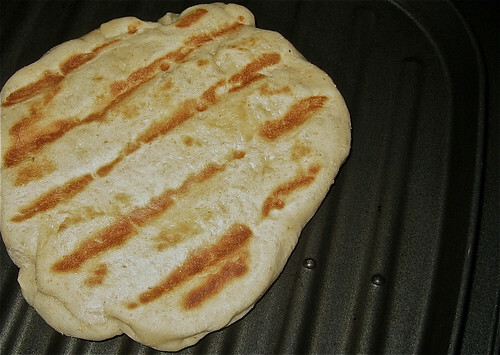 Grilling Naan on the Foreman Grill. Gena's sweet-potato hummus has changed my life. I adore it. I added a touch of cayenne in place of the black pepper. I make a big vat and eat it with everything. I first made these almond cookies for a New Year's Eve party, because they pair well with champagne. These are not kid cookies — they're more refined — a little sweet and a little salty. I use Trader Joe's Almond Meal in place of grinding my own almonds. To go with the red lentil curry I mentioned a few posts back, I decided to try making Naan. In the comments mentioned grilling these on their Foreman grill, which worked like a charm. My plan is to make a double batch of these and freeze a bunch to have on hand whenever the mood strikes. They're delish and certainly should not be reserved only as an accompaniment to Indian food. For my birthday dinner I wanted mediterranean food. We picked up a bunch of sides at the amazing Barbur World Foods and I made this simple, flavorful Fish Couscous with Onion T'faya as a main. Honestly, I was taking a chance, especially since we subbed frozen Wild Cod from Trader Joe's for the much more expensive Halibut the recipe called for. It turned out great and will definitely be added as a regular dinner entrée here. Even Anna loved it. Thanks for all the tasty links. I can relate to your kitchen time being more rushed - same here. I just made fresh hummus this morning; who knew you could make it with sweet potatoes? I can't wait to try it. I'm also on a mediterranean food kick right now thanks to a little greek cafe in cville. They make the most amazing souvlaki with tzatziki sauce which I am determined to master at home. I am jealous. Even your rush kitchen time seems 200% more exciting than any of my time in the kitchen. Since Maël was born, my desire to be in the kitchen has decreased and I don't enjoy cooking as much as I thought I did. These recipes sound wonderful though. I will keep this in mind.